The Pittsburgh Business Times this week published its 2018 Honor Roll of top public school districts in the 5-county Pittsburgh region, and two of our new home communities are located in the two top districts — South Fayette and Upper St. Clair. This year’s “best of” list was compiled based on three years of standardized test scores and included 105 districts in Allegheny, Washington, Beaver, Butler and Westmoreland counties. Happy Halloween from Paragon Homes! Here the Trick-or-Treating times you need to know, curated from Pittsburgh’s WTAE Channel 4 Action News and individual township website. PLUS: check out our Halloween and other seasonal tips from previous Paragon Homes blog posts, here. All trick-or-treat times shown below are for Oct. 31, unless otherwise noted. 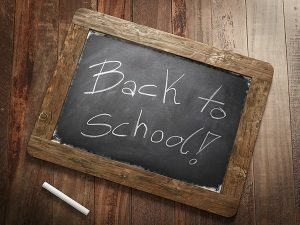 – Avalon 6 to 8 p.m.
– Baldwin Borough 6 to 8 p.m.
– Baldwin Township 6 to 8 p.m.
– Beaver (Oct. 29) 6 to 8 p.m.
– Bellevue 6 to 8 p.m.
– Bethel Park 6 to 8 p.m.
– Brentwood 6 to 8 p.m.
– Bridgeville 6 to 8 p.m.
– Butler City 6 to 7 p.m.
– Castle Shannon 6 to 8 p.m.
– Cecil Township 6 to 7:30 p.m.
– Charleroi (Oct. 29) 6 to 7 p.m.
– Cheswick 6 to 8 p.m.
– Churchill 6 to 8 p.m.
– Collier Township 6 to 8 p.m.
– Connellsville 5 to 7 p.m.
– Coraopolis (Oct. 29) 6 to 8 p.m.
– Crafton 6 to 8 p.m.
– Cranberry Township 6 to 8 p.m.
– Crescent Township (Oct. 29) 6:30 to 8 p.m.
– Economy (Oct. 30) 6 to 8 p.m.
– Evans City 6 to 8 p.m.
– Forest Hills 6 to 8 p.m.
– Forward Township (Allegheny) 6 to 8 p.m.
– Fox Chapel 6 to 8 p.m.
– Franklin Park 6 to 8 p.m.
– Green Tree 6 to 8 p.m.
– Hampton Township 6 to 8 p.m.
– Hanover Township 6 to 8 p.m.
– Hempfield Township 6 to 8 p.m.
– Hopewell Township (Oct. 29) 6 to 8 p.m.
– Indiana Township 6 to 8 p.m.
– Jeannette (Oct 29.) 6 to 8 p.m.
– Jefferson Hills 6 to 8 p.m.
– Kennedy Township 6 to 8 p.m.
– McKeesport 6 p.m. to 8 p.m.
– Monroeville 6 to 8 p.m.
– Monroeville Mall (Oct. 30) 6 to 8 p.m.
– Moon Township (Oct. 29) 6:30 to 8 p.m.
– Murrysville 6 to 8 p.m.
– New Kensington 5 to 7 p.m.
– North Huntingdon 6 to 8 p.m.
– Oakmont 6 to 8 p.m.
– O’Hara Township 6 to 8 p.m.
– Penn Township (Westmoreland) 6 to 8 p.m.
– Peters Township 6 to 8 p.m.
– Pine Township 6 to 8 p.m.
– Pleasant Hills 6 to 8 p.m.
-Robinson Township 6 to 8 p.m.
– Sewickley 6 to 8 p.m.
– Sewickley Heights 6 to 8 p.m.
– Sewickley Hills 6 to 8 p.m.
– South Fayette Township 6 to 8 p.m.
– Swissvale 5 to 7 p.m.
– Tanger Outlets 6 to 8 p.m.
– Trafford 6 to 8 p.m.
– Upper St. Clair 6 to 8 p.m.
– Verona 6 to 8 p.m.
– West Deer 6 to 8 p.m.
– West Mifflin 6 to 7:30 p.m.
– Whitehall 6 to 8 p.m.
– Wilkins Township 6 to 8 p.m.
South Fayette Township School District has been once again named a top school district in Western Pennsylvania and the Pittsburgh region. In fact, this year, it outranked some of the other communities in the area, coming in at #1! 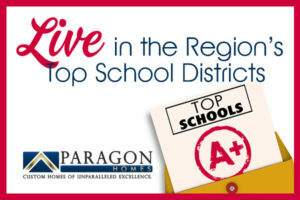 We at Paragon Homes custom home builders are proud to build in several of the school districts on the list, in some of the most sought-after communities and suburbs of Pittsburgh. It hasn’t been the only honor to be bestowed upon South Fayette and other local schools in recent weeks, however. In fact, SF was also named one of the ‘Most Challenging’ school districts in the entire nation, by the Washington Post — an honor for academics, and, perhaps, a frustration for students. Nonetheless, Paragon Homes is Lion Proud! 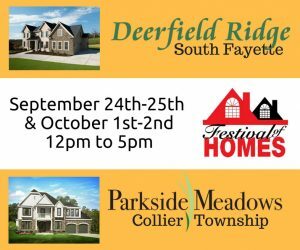 Check out Deerfield Ridge in South Fayette! South Fayette has unseated Mt. Lebanon School District as the Top-Ranking School District in the Pittsburgh region, according to the Pittsburgh Business Times. 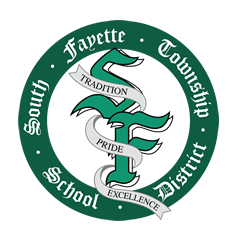 SF has consistently performed well in this annual list of school rankings, but this year the green and white Lions have skipped ahead to claim the #1 spot out of 103 ranked school districts in Western Pennsylvania. Paragon Homes has a community right near the esteemed South Fayette Township Schools. Deerfield Ridge had its Grand Opening in June 2014 and continues to be a sought-after new home community. 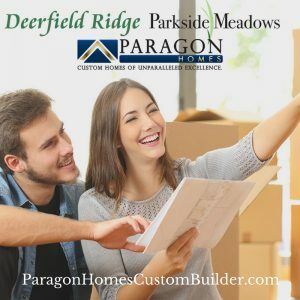 Build a custom-built Paragon home in Deerfield Ridge today! You’ll love South Fayette and all that it has to offer — and with Paragon Homes, you can craft a custom-built home to suit all of your unique needs. 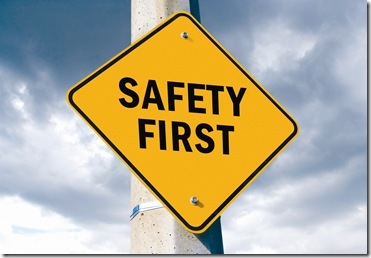 Recently, Safewise detailed a list of the 50 Safest Cities in Pennsylvania. 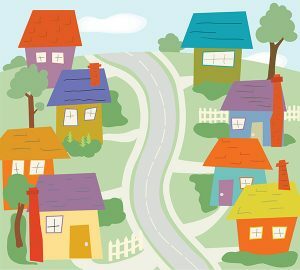 It comes to no surprise to us that many of these cities, towns, and regions are the home to Paragon Homes communities. At Paragon, we pride ourselves on building our luxurious, family-friendly new home communities in the best, most-thriving, and safest communities in and around Western Pennsylvania. Some Pittsburgh-region all-stars that stood out to us on the list? Cecil, South Park, Franklin Park, Murraysvile, Upper St. Clair, Mt. Lebanon, South Fayette, Peters Township, Bethel Park, Shaler, and more. For a full list of the safest areas in Pennsylvania, view the original article, here.